As discussed in Is There a Difference Between Taxonomies and Categories, taxonomies refer to a generalized system of classification and organization of objects or data. In the case of WordPress; Categories, Tags, Post Format(ting), and Link Categories are built in taxonomies used to help classify and organize posts, links, and metadata. 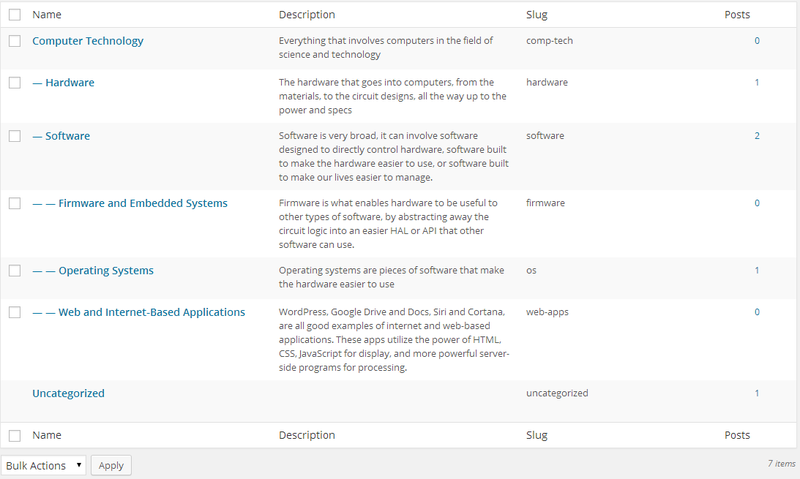 Terms are instances of these taxonomies; take for example a WordPress blog about computer software. If one of the taxonomies is a category, then one of the terms would be programming languages, because programming languages is a topic in computer software, and could be considered a categorical taxonomy. Additonally, WordPress developers and Plugin developers may utilize the register_taxonomy() function to initialize the built-in taxonomies, as well as create new taxonomies in WordPress. get_term_heirarchy(): Returns all of the term IDs of a given term's children as an array. term_is_ancestor_of(): Does just what it says; compare two terms, with term one being the term of reference, and term two the term to check for ancestry. My goal here is to find out which categories don't have any child categories ( or descendant terms, to be more general ). I also don't want to ignore empty categories ( categories that have children but don't have any posts that reference them ). Does WordPress have an easy way to do such a search? If so, are there performance concerns I should be worried about? All of these have no children, even though some have an empty count. How Does This Query Work? However, we also need the names of the categories which is stored in the terms table, so we join the two tables together using an INNER JOIN, which also ensures that only rows of data common to both columns are included ( as opposed to an outer join ). Both tables being joined together need a common column to "stitch" them together. Finally, we exclude categories where they appear as a parent for another category in the term_taxonomy table. To do this, we use the keywords NOT IN, and construct another SQL query inside to SELECT everything in the parent column within term_taxonomy. This nested SQL query then provides which term ID's should be excluded from our results as they have entries in term_taxonomy.parents, indicating they are parents of another category. Interestingly, this does return the correct rows, but doesn't include the category name. This is because we're selecting all of the columns from the wrong table, main_term_taxonomy. So we must switch the tables' places in our SQL to get the information we desire. Not the answer you're looking for? Browse other questions tagged categories taxonomy terms get-terms or ask your own question. Why does WordPress combine a term with the same name in the wp_terms table?